Each week past so fast. New girl come again and I know many people want to see her design. Now a maid girl. 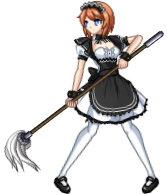 She come to clean your pervert soul with her mop. She is my favorite now. I found this maid outfit from Marika, Nisekoi and fell like "That it! This is maid I looking for" Now time to think about her combat and coding. Only Wizard girl left. lol this is excellent! A mop? Does she fight like the halberd-wielder at all? Does she have bucket-of-water based attacks? I am so happy about this one, hahaha. So are you designing the bosses next, because I think all the ones you've shown us are regular enemies. Are you going to show the designs for the other demon girls or will that be a secret too? Saving them for last? How long do the bosses take to develop vs. the regular enemies? They seem to have a lot more animations. Boss take more times than regular girls. Only a bit more time for animation but take a lot more for coding work because they must have something special to fight against player like evade, counter, endure, combos(and this often cause bug). I take 2 week for only test+coding second boss(Elite Fencer) But I think other bosses will take less time since I have more experience. Alright. How much will this game cost and when will it be released? Just asking , have You make something like schedule plan? I make schedule plan in my mind.